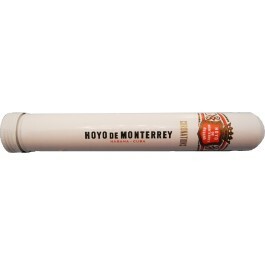 The Hoyo de Monterrey Coronations Tubos is a cheap daily smoke, of corona format, with 42 ring gauge, 5.1” (129mm) long and comes in a box of 15 cigars. This short smoke packs the typical Cuban flavors that can be smoked on-the-go as it comes in an elegant and convenient aluminum tube. The flavors offered by this Habanos are of wood, earth, leather, coffee, nuts, fruits and floral characteristics. Established by Jose Gener in 1865, the name roughly means "valley of Monterrey," a particularly fertile site in the Vuelta Abajo, which had been farmed by Gener since at least 1860. The brand offers a lighter flavour and a wide range of sizes, the largest of which are much celebrated. The Le Hoyo series cigars was introduced about 1970 and presents a stronger flavour. A mild Hoyo in Aluminium Tubes.